Siobhan Morris recently sat down with our visiting fellow, the illustrator Francesca Sanna, to discuss her award-winning debut children’s book, The Journey, her research process, and her current work with the Reluctant Internationalists project. A transcript of the conversation is now available below. SM: Welcome to London and to the Reluctant Internationalists project team! Let’s start by talking about your route into illustration. FS: I first studied architecture. I always studied the theory of colour and painting; I had painting class when I was in middle school and I always always had an interest in children’s books especially. After my bachelor in architecture, I had during this time, the opportunity to do graphic illustration because that was one of the courses they have there. I’m not sure you have the same here, but in Italy ever since I was young you have this feeling that you need to do something pragmatic and concrete, study something that is not just like drawing, because you need to find a ‘real job’. So, especially for this reason I went for architecture. I love to study architecture, I love to study the history of architecture, but it was not my thing. During an internship I went to a communications studio and I did an illustration project and that was the moment I decided to go with illustration. It means also very different things, you have lots of different projects, but now my main focus is back to children’s books. SM: Well, let’s talk about your first children’s book – The Journey. It was created as a result of a series of interviews with refugees? FS: Yes, together with more formal research – reading social papers, investigation of newspapers about the topic etc. It was more than three years ago now and it was not very easy to find anything that had to do with the theme. There were very few picture books about the topic. But first I went to the interview process. I was suggested that method for the research and we had some guidelines around unstructured interviews. That for me was a very good description of what I was doing. I was sitting with people, asking some questions, but for most of the time we were having more of a normal conversation about anything and we were sketching because we had so many problems with languages. We never spoke the same language more or less. It was normally people arriving in Switzerland and they were talking their own language which was nothing I knew about, plus German. At the time my German was terrible, so I was speaking really basic German and some English they didn’t understand and sometimes they knew a little bit of Italian because in their journeys they went through Italy. So we were sketching [and] obviously for me it was a really good tool, also for the research part. SM: How many interviews did you conduct in total? FS: Complete interviews, stories I could actually use, or read back and read again after we talked, probably about fifteen. SM: All conducted in Switzerland? FS: No. I went to Italy for holidays. I remember it was during the Christmas holidays. I was in a refugee centre in southern Italy because my mum worked there for a while and it was the research semester that ends in February, so Christmas was like the peak of the semester. So I thought it would be stupid to waste an opportunity, so I went there [to the centre] and this point was so important because the bad stories, for absolutely random reasons, were all there. So people I could relate to, because of the age, because they were mostly women or girls as old as I was at the time, and a series of other factors, put together a really good series of conversations. SM: So in that sense, is the book quite personal even though it is about refugees? FS: Yes and this is really crazy to try to explain. This is not my story, but there are details [which she can relate to]. Also this was the strength and whole point of having the interviews, was to find a point in common between me and the person I was interviewing. Otherwise it was impossible to talk about, on a really personal level, really tough topics. SM: What were the greatest challenges then to undertaking the research? FS: In the research, my main concern was not to be naïve. The other problem was not to have this horrible feeling of, ‘oh my God, this is so sad’, like in a pitiful way somehow. 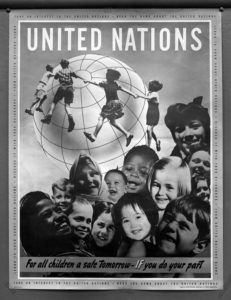 So I studied first a lot of visual material about refugees, the campaigns from the UN or UNICEF, and tried to see what was the common denominator. Of course you need to convince people to donate money, but at that time especially you had always passive depiction of the person as refugee, labelled as a refugee. Double passive actually because you have this huge label and then you also have a person crying or a poor person, or someone struggling, really vulnerable. I remember as I was writing my thesis on this, my main idea was how illustration can help passive depiction become active, because graphic novels and visual storytelling in general, are another really good tool in my opinion to show an active point of view. And while I was doing this I saw these campaigns changing a little bit to be more personal, like the UN did a series of personal stories. SM: The research you were conducting into these campaigns – was this historical research or were you examining contemporary campaigns? FS: No, it was looking at what they were publishing now, the websites etc. SM: What were the challenges to undertaking the interviews? FS: In this sense, I was really naïve! I went without any training. I knew about in Switzerland what was the procedure behind asylum seeking, so the process of having a visa after they arrived in a new country. So I knew more or less the backgrounds of the people I was talking to. So I went to the refugee centres but the interview was almost never conducted in the refugee centre, because that’s like going into somebody’s house, this was my feeling. In the refugee centres these people were having lunch, sleeping, they had their rooms, so if I was invited in their rooms – that happened in a family refugee centre, that was really good, we had a drink together. We drank cola together, but I was invited by them. Otherwise, I tried to just get in contact, I was working a little bit with a language centre in the refuge centre, so getting in contact afterwards like, ‘let’s get a coffee together’ and having the interview like this. So the challenges were of course except for the language, trying to find a respectful way of talking about this, these experiences from a privileged point of view without feeling guilty all the time. SM: Would you recommend it as a research model? FS: It worked for me in this case, but it’s also very specific. Yes, I would say without this process the book would not exist because you need to hear – the only way to hear the personal point of view is just to hear all the different people and actually it’s like putting together in the same box so many different things and so many different experiences. I think to realise this, I had to go through this process. SM: I think that’s one of the really interesting things about our collaboration is how in history to put the personal into the wider narrative, when these people so often don’t have a voice. How do you view this collaboration, working with a group of academics on this project? FS: This for me was the hardest part – I had the stories but it was really time consuming to collect stories and also I had the feeling I need to zoom out a bit of this situation and find papers that talked about refugees narratives. That was the hardest part, doing my own research or trying to find the interesting parts. In this sense I think it [the collaboration] is great, having a conversation with people who know exactly what the context is. In general, as an illustrator you deal with a lot of very different things or things you don’t know much about and the hardest part is not being able to deal with people who know what they are doing. So if the focus is already there and you have a lot of academic research and so on, it is great – already having a selection of documents or readings to work on. SM: Another thing I wanted to talk to you about were the ethical concerns. Unlike much of history, you are dealing with people’s lives as they are being lived currently. Did you feel an obligation to tell these people’s stories in a certain way? FS: I tried to focus on what these stories had in common and I think this was an interesting point because at first I could only see the differences. So at first, these people were coming from different countries with nothing in common. But then in the stories, especially in the element of the journey, there were always elements that I could see repeating. The other approach that was kind of saving my brain from becoming too overwhelmed by the fact that these are people’s lives were the details. The way they spoke about these stories – for them it was the reality. It was nothing to be sad about. But in some parts of our conversation some points were way too much [but] my questions were never really like questions, like ‘how did you run away?’ It was never like that. We always started talking about personal stuff and then the things came out. The details really stayed with me until I started the book. It’s really strange how a person’s mind works, how you remember, how you want to communicate, say, that one detail in a story. I keep saying this example and obviously it stayed with me until the end of the book. It was of this girl and we had a great conversation, also because she spoke perfect English. So I asked her where did she learn to speak really good English and she told me she was studying to become a flight attendant before she had to leave. And then we started a discussion about flying in general and how this could be a perfect metaphor for this whole thing, what this general story was about and how strange it is, from a really naïve point of view, how strange it is that you can just take a plane as a means of transport… If this is not an option anymore, this becomes an incredibly long journey then. You have a destination in your mind but you are moving around in a totally different way of having a journey. I know it sounds again really naïve, but to have this conversation with the person who had this experience and completely knew what it was like to take a plane and fly and she wanted to make that her job – for me this was incredible. This thing about flying and the birds that fly was really something I was shocked about [and it’s the last page of the book]. So the book is called The Journey, also because let’s call it the theoretical part, or the theory, behind my thesis was how illustration can help this journey element to be told. Because it’s like an archetype in children’s books or children’s literature, as development of a character and growth (Alice in Wonderland is one example of a specific metaphorical journey. I found a paper, [BenEzer, G & Zetter, R (2014) ‘Searching for Directions: Researching Refugee Journeys’, Journal of Refugee Studies, Oxford Press, vol. 27, no. 3 , May 2014], and it was about the importance of the journey as an element between the departure and the arrival especially in refugee narratives. Also the thesis behind this paper was that this element, nobody knew much about this and it was so important because it could show the active role. This was the same going through children’s literature and finding the same journey as metaphor in huge works of children’s literature. So I found this kind of coincidence or point was also an element that came up a lot during the interviews. The main discussions we had were about the journey, it was one of the main elements and so I decided to focus on this part. But I also had to officially make a decision, so it was so open this topic of immigration of the longest time I thought about the theme of integration because I saw myself, I lived myself [when moved to Switzerland], the problem of learning a new language and the culture shock and so I also saw that this was something in common with everybody. We all had to struggle with German, we all had to struggle with the Swiss weather – some people liked it because they were coming from Tibet! – and with the Swiss bureaucracy. Or the reason why someone has to flee his or her home, or the reason why you would put your children on a horrible journey, what you have to leave behind, this was another point that was really interesting. It was too much at one point. I remember doing like a diagram and there are three steps. There is like a bomb or something that explodes, there is like what happens when you find your home not safe anymore. So there is everything before and everything after you arrive in a new country and of course in the newspapers every discussion is about how this is going to change our European way of living. And then there was this journey that really fascinated me because no one was talking about, no one was saying very much about this at this time. Today I think there are more documentary photographers that want to record journeys. There was this family that recorded their journey [as refugees to Europe] with a GoPro. Their journey for me was the first time I saw these things happening on a camera, it was incredible, but still a gap somehow. This was incredibly fascinating for me. So I thought ok, it can work as a growth of a character in the sense that there are obstacles and you have to overcome these obstacles and we will somehow solve the problem with these passive depictions and it doesn’t have to be about refugees –the topic is not being a refugee or let’s help refugees, it’s about how your life would change if you had to flee your country and your home and so on. Something clicked there. SM: When we have spoken before you have mentioned that the bureaucracy around applying for asylum necessitates that refugees have to learn a story and learn what to say. Were you concerned this would affect your interviews? FS: I was trying to prepare myself for this. So when we had a conversation, I was always saying that I was never recording. I was writing down notes that they could see. I was drawing for most of the time and for most of them this was already nothing to be concerned about. They told me, we were taking the car to go to the mountains, so I was drawing the mountains and a car going through them. SM: That’s really interesting. People probably opened up and told you more because you are not interviewing in a traditional way. FS: Yes, both of these two elements, my language skills and the fact that I was sketching and using sketches at the main tool, brought the conversation to the same kind of level. First, it was not them in a difficult situation and me in a privileged situation, it was the opposite actually. Also the drawing is something connected to spontaneity. This is some kind of thing which is much more emotional, it is not so clear and fixed as words. I was not really taking notes that I could have used in formal and official procedures in an interview. SM: But it is also clear that you are telling their story, because you are literally drawing in front of them exactly what they are telling you. FS: Someone was telling me about his really terrible experience being tortured, but being so pragmatic and showing me his scars and I was just drawing the same thing I could see. I do not think I would be able to do this with words. 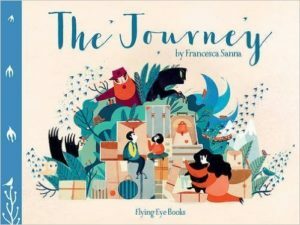 SM: I was reading an article recently where someone was asking if it is possible to create meaningful children’s books about refugees if you yourself are not a refugee, but clearly The Journey proves that it is. Do you think the book is influenced by your perspective – I know you have previously called yourself a privileged immigrant – do you think that changes how your write? FS: I think it doesn’t, it just changed the way I was really interested in the topic from the beginning. But this would be a combination of [the fact] I was a foreign student, or an international student and I found myself discussing a lot about this political moment and especially about the topic of immigration. I live in a country now [Switzerland] that has some strong political decisions about the topic. So of course you have discussions with your family and also seeing how this topic is discussed in different countries. I was coming from Italy where this refugee crisis and immigration in general – these discussions started four or five years before it started in Switzerland – for obvious geographical reasons. And so all these pieces put together I think started this interest. SM: So let’s talk about the use of illustrations in history and social science. FS: I tried to put together my ideas before I started with the drawing. Why am I doing an illustrated book not a normal book? I think the main power of illustration is it can move the focus from something that can be really literal, like you have a sentence and this sentence means something happened, but then you can add so many layers to this with a picture. I would not be able to do this with writing. I played a lot on this in the book. So the text says something and the pictures say something different. There is a very pragmatic example, because it is quite hard to explain without an example, in the book there is a smuggler and so I knew that this is a character who is always present in the story of a person who has to flee. There’s always someone who helps with the money exchange and from when you read a newspaper you have a discussion about these people. These people are criminals and because of them thousands of people die and they take profit out of desperate people. So there is a judgement about this kind of character. At the same time, when you talk to a person who had to call the number of a smuggler, they told me that this was the only way they could, there is no legal way. It is their only option. So what do you do? You die or you go for the illegal way. So to undertake the risk is something that you almost can’t decide so there is like a blurred line. And the third problem for me was how do you explain this thing? For me it is already so hard to explain to you in this moment, so how do you explain to a child? Do you say ‘oh it’s really bad’? How do you say that? So I didn’t say it, I suspended the judgement. So you have a huge monster in the book, or a character who looks like a big monster, and there is the size element. He is big and he is moving these people around. This for me was a metaphor to say that they don’t have any choice. But you don’t know if it’s bad or if it’s good, just ‘it’ is there and they need him. And again this is something I could only do with a picture, through a series of pictures. SM: One of the really striking parts of the book for me is the border guard in the forest and how scary and graphic the depiction of the guard is. FS: This is because when I heard the stories, the point of highest terror is to have to go back. When you are walking for days and months and crossing borders one after the other, the idea of someone sending you back to the starting point is the scariest thing. So the first time you see the guard it is not the guard himself, but it is a big finger that is pointing to the back of the book. The directions in the book are quite important. Because they are travelling and because I live in Europe, the reading sense is left to right. So everything happens from left to right unless it is an unnatural movement – so the war arrives from right to left and the guards also. When they are travelling in the car and on the bikes, it’s super strong in the other direction. All these elements, in my theory work I call them narrative devices. As a poet would do in a poem with the use of figures of speech, you can do with pictures. SM: Let’s talk about using The Journey as a teaching resource. FS: So in general what happened after this book became a book and I started using it with children, is that it kind of helps children who know nothing about these stories to learn about the stories. But children who have these experiences I have to be much more careful using it with. It’s always about the personal story and you never know their personal point of view. In general, it is about what happened to a child. This is why I would now like to explore a little more about the inner perspective, this is something I think can be done with pictures and picture books. SM: In this way, the book is intended to tell more than one story; you are not focusing on one crisis or one family. FS: Exactly. I really don’t want a child to see this book as, ‘oh this is about me because I’m different from the others, and this is my story’. This was absolutely not the point. SM: So could you maybe talk a little about your experience in using the book in school workshops? FS: I have worked in three different countries. I normally do activities that are not directly linked to the book. I also do readings and children have thousands of questions –that’s my favourite part! Also when they ask me what is the message of the book as I hate books with messages! So the idea of having done a book with a message is like, ‘oh what have I done’! I understand that there is like a message behind the book, but the main point was to start a conversation, or start a discussion. This is not easy. When you empathise with the story, it becomes like your story. It’s like an empathy exercise. SM: I guess that’s why the book doesn’t end with a conclusion? But people find this hard because it makes them think and question what could happen next. FS: Children, they hate it! A teacher sent me an email with a series of questions from pupils in the class and one of them said something like, ‘why did you end the story at the best part, the best point of the story?’ I felt a little bad! But what I answered was: I want to know your ending, how you think the story should end…Because it [the refugee crisis] is happening now, writing an ending would be first of all risky and also not useful. SM: What do you feel there is to be gained from collaborations such as this, between researchers and authors/illustrators? Because many people would regard history and children’s literature as two very distinct disciplines but is seems there may be links between them. FS: As an illustrator or a children’s author, you never have so much space and time to take your time with the research before you actually start the book. So I couldn’t ask for anything better. I love that. When I write a book about animals, I try to go to the museum and draw the anatomy of the animals or try to kind of find the visual research that gives meaning to the work. So in this sense, it’s [the collaboration] perfect. SM: Can we conclude by discussing the field of children’s literature in general? A lot of children’s literature nowadays is historically based, but rarely do authors work with historians – why do you think that is? FS: In general I think inter-disciplinary projects are really hard. There are a lot of non-fiction children’s books but a lot of authors think of history as a story and then you tell this story. But it is not really like that. As I have heard a lot during our meetings already, there is not one history and in the same sense there are different ways to think of a story and using illustration you can add so many more layers. SM: Why do you think there is a move to non-fiction in children’s literature now especially? FS: This is an interesting question. I saw this even before I started studying illustration. A juror in an illustration competition, he was a curator of a museum, and he said that thousands of illustrators took part but ninety per cent of these were stories about animals or Alice in Wonderland. I understand there is a lot of simplification or metaphorical communication of a really important topic in a fictional way. 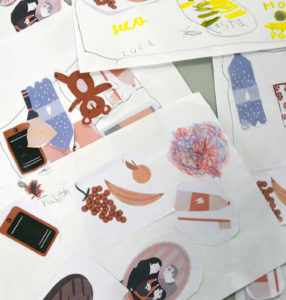 I found it really interesting in the competition that the projects that were selected and that you could remember, you could tell that they were about something the illustrator or author was really concerned about. They were about the environmental crisis for example. Things that children are exposed to and for you as an author of the pictures, it is part of your daily discussion and part of what you sit at lunch and it always come up. I don’t know why there is a tendency [to non-fiction] now but I see it for sure. I find it really like a therapy. This feeling of being completely powerless in front of political decisions and this political atmosphere that is now around…This is the super privilege to have the opportunity to do a book because you really feel like you are doing something and especially with non-fiction you have a bigger picture. You can apply them to what is happening now. SM: These considerations are very important to the project as well. Thank you very much Francesca! Earlier this month, the Reluctant Internationalists held a one-day workshop on the process of researching, writing, exhibiting and depicting stories about refugees to children. 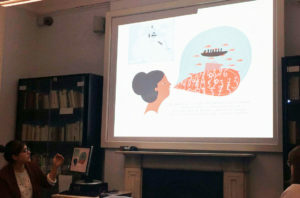 The workshop brought together children’s authors, illustrators, publishers, museum professionals and academics to juxtapose different disciplines’ ways of depicting the stories of refugees for children. Discussions in four sessions explored how factual research, both historical and contemporary, can be interpreted for children. The first session of the workshop addressed the role of illustration in refugee narratives. Our visiting fellow, the children’s illustrator Francesca Sanna, shared details of the research involved in creating her award-winning book, The Journey. Her research included detailed interviews with refugees based in refugee camps. In her talk, she discussed some of the challenges she encountered during this process, some of which were resolved by her commitment to drawing and sketching with refugees themselves. Francesca’s presentation prompted wide-ranging discussion from workshop participants, such as on the problem of aestheticizing or sweetening the experiences of refugees when trying to interpret them for children. Francesca argued that her research on the aesthetics of UNICEF campaigns had convinced her that frequent repetition of the same images of refugees made campaigns less powerful and effective. The second session considered how the stories of refugees are communicated in public display. 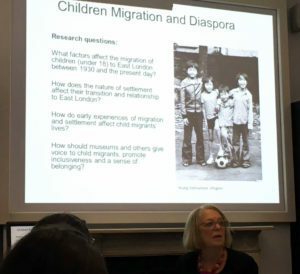 Eithne Nightingale presented her current work on ‘Children, Migration and Diaspora’ in collaboration with the V&A Museum of Childhood and Queen Mary, University of London. 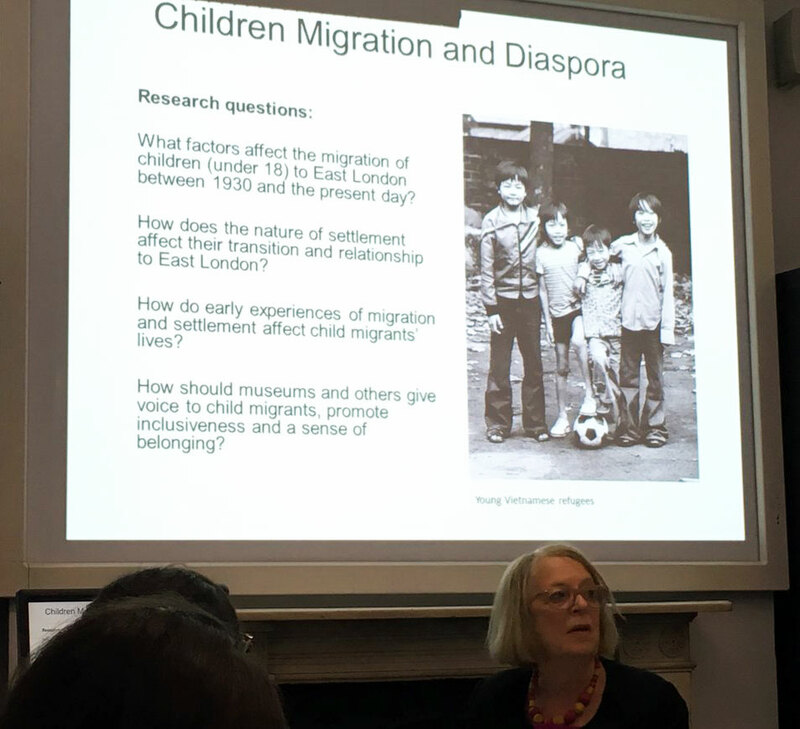 Eithne discussed the co-production of migration stories with child refugees through film, social media and public events in museums. She raised problems such as the need to build trust between interviewer and interviewee and the importance of oral history training. These questions foregrounded the screening of the film Passing Tides from the Child Migrant Stories project. Linh Vu, whose personal story was the focus of the film, then reflected on her own migration experiences. Like Francesca, Linh also emphasised the importance of drawing as a means of depicting traumatic experiences. Following both talks, discussions zoomed in on questions of terminology and bureaucratic categories of different kinds of people on the move, particularly in the cases where individuals interviewed for the project did not adopt the term ‘migrant’ for themselves. Many of the authors present echoed their concerns about finding suitable terms for writing and depicting refugee stories for children. The third session of the workshop centred around Dr Kiera Vaclavik from Queen Mary, University of London and her talk on lessons from literature that presents explicit historical and political narratives to young readers. Kiera examined two in some ways problematic, French books (Rêves amers by Maryse Condé, and Evelyne Brisou-Pellen’s, Deux grains de cacao). She noted that depicting the stories of refugees in children’s books can allow ‘a crime against humanity to become the background to an adventure story.’ Kiera’s talk and the subsequent discussion addressed the political limits of empathy, the importance of achieving a balance between pity and empathy, and the dangers of objectifying the reader. The remainder of the afternoon was devoted to a discussion of the publication process of children’s literature. 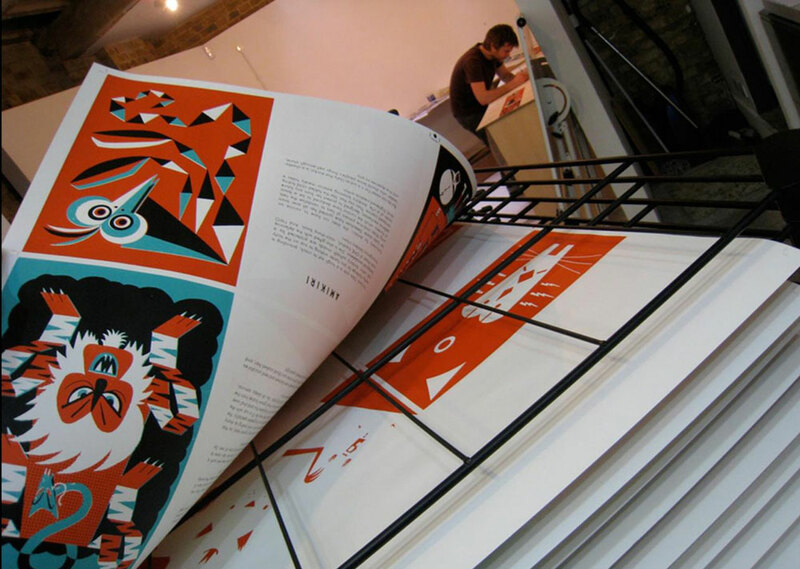 Harriet Birkenshaw from NoBrow/Flying Eye Books provided an introduction to the work of her publishers. Harriet noted that one in four books bought today was a children’s book and creative non-fiction is the fastest growing market. 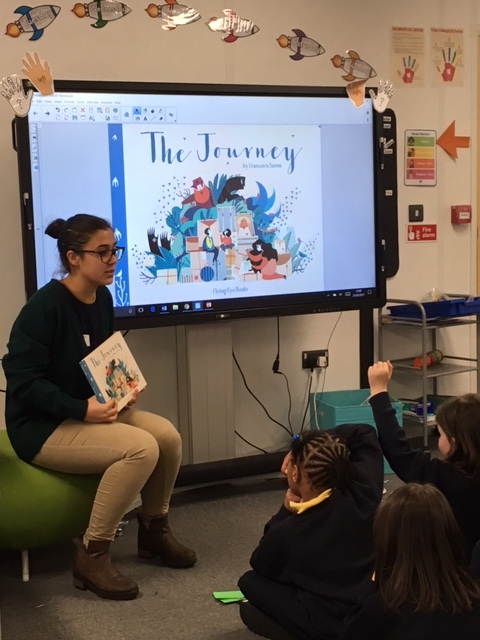 She emphasised how important it was, in such a saturated market, that children’s books had a purpose and a powerful narrative that speaks not just to children but also to an adult audience. Her presentation provided examples of works that achieved this and also provided insight into the compromises that had to be made when publishing a children’s book. Following the success of the workshop, we will organise a similar event at Birkbeck in June, with a wider range of participants. Further details of this will be available on our blog and the events page of our website soon. Discussion in week six of our Teacher Fellowship Programme, ‘The Cold War in the Classroom‘ in collaboration with the Historical Association, focused upon whether it was possible for powers to stay out of the Cold War, or even to utilise tensions and rivalries for their own benefit. In the following article, originally published for The Historical Association, Ben Walsh summarises the discussions. Was it possible to opt out of the Cold War? There was another shift in content focus in week 6, to an area which was discussed in the residential back in January and which was new to many of us. The key issue was whether, or to what extent, states were able to stay out of the Cold War, or even to use Cold War rivalries to their own benefit by playing off one side against the other. Using the 1961 Declaration of the Non-Aligned Movement along with extracts from Best et al’s chapter on neutralism and Goff’s article on Tito’s tour of Africa (see references below) the teachers examined these generally under-represented states and issues. We asked them to respond to the view that ‘The only figures students need to know about are US Presidents and Soviet leaders’. Predictably this sparked some lively responses! Key points emerging in the discussion about the history were…. I think there is a point to be made about the difference between the ‘NAM’ and ‘non-involvement’; after all, whilst countries like Yugoslavia tried to distance themselves from either side, they were heavily involved in the ‘big event’ – like it or not. Berger’s article confirmed my belief that nationalism, in particular pan-Latin Americanism, played into the hands of the Super Powers – so, while many countries were attempting to ‘do their own thing’ they were still often being toyed with by USA/USSR. Best et al taught me lots about Yugoslavia, Finland and Austria’s attempts to remain neutral – if I’m honest, I didn’t know Austria was ‘neutral’ until this moment (and wrongly assumed Finland was under Soviet yoke)! Students need to understand that there is no such thing as non-involvement in the Cold War; every leader of a country across the world, and every subject within those nations had their own perspectives about the events which were taking place – and they all contributed in some way. The Cold War is a perfect opportunity to teach students about the impact of ordinary people on a major event and the vice-versa effects of a larger event on a personal scale too. For example, no one would try to tell the story of the First World War without explaining the actions of a group of Serbian teenagers, or of the experiences of the ordinary soldier. Similarly, the Cold War is best understood through the eyes and experiences of those people who were affected by the American and Soviet leaders.The best examples are the leaders of Eastern European countries (from Tito to Krenz) – who provide an array of opportunities to better comprehend the Cold War. Students should learn to understand that some of those leaders were self-serving autocrats while others were keen to challenge Soviet authority and the style of communism which existed within their countries. And most importantly, all of those leaders had their own ideas – none of them were drones who always did as they were ordered. Students flourish when they gain the full picture; therefore, if they are taught about the aims of Dubcek, the worries of Gomulka, and the callousness of Rakosi then they will better understand how the Cold War played-out the way it did. The Cold War away from the bipolar conflict of America and Soviet Union reveals a complex inter-web of relationships and motivations. The NAM [Non-Aligned Movement] almost seems like a contradiction in itself, an alignment supposedly to each other rather than one of the superpowers. Their role is crucial, speaking on behalf of the southern hemisphere which otherwise would be largely used as puppets (a term worth debating) in the power play of the Cold War. Interestingly this movement allows them almost to choose sides, should their ‘conditions’ need them too, Cuba being a good example given here. The case of Finland is a fascinating case study of a western state establishing a ‘neutral’ relationship with the USSR, something which Best describes as a luxury in the post war world. This is a powerful example to demonstrate to students (in a different way to Yugoslavia, as a former socialist state) that Europe was not simply a battlefield divided into two by the Cold War. However, the character of Tito is a brilliant one for students to grapple with and his strive for importance in the NAM in the 1950s and 1960s. The exhibition of photographs of Tito in Africa is a fascinating example of showmanship and the power of personality in gaining ‘influence’ globally. As Best says, the concept of neutrality as actually existing during the context of the Cold War is important, particularly as it resulted in a severe reaction from the superpowers, John Foster Dulles ‘morally corrupt concept.’ Whether you could apply this quote to Tito would be a fascinating study. Even before India gained independence in 1947 Nehru had set out his position. India would ‘follow an independent policy, keeping away from the power politics of groups aligned one against another’. (Best et al.) Arguably Nehru’s determination to remain non-aligned eventually forced the US to change their approach, offering aid in 1958 to try to win sympathy, an approach extended under Kennedy. Nehru’s independent stance was then compromised following the Sino-Indian border war of 1962, following which he accepted military aid from the US and Britain.It is clear that despite this desire for independence each of these leaders were of course responding to an agenda that had already been set by the conflict between the two superpowers. The need for economic assistance and development ultimately compromised the moral and political decisions that each of these leaders took, leading to some degree of alignment with one or both of the superpowers at some point. So perhaps it was not possible to opt out of the Cold War for economic reasons but the attempts too are worth consideration and a move away from an over focus upon US and Soviet leaders can only enrich our understanding of the complexities of this period of history. The discussions were very satisfying in the sense that the teachers were beginning to think about their practice and how the up to date academic work they had been looking at might shape future practice. Most of the teachers also now have a broad area of focus for their planned resources, which will of course be shared on the HA website. I agree with this statement in terms of where students should start their studies of the Cold War. The beliefs, actions and reactions of the leaders of the two superpowers are of first importance when seeking to understand the Cold War as a phenomenon and series of events. … However, that is not to say that other nations around the world are unimportant, but that we are on dangerous ground, and repeating the mistakes of leading powers, if we just view them through the lens of the Cold War. Therefore a better enquiry would perhaps be to ask ‘Did the USA and USSR interpret the ‘Third World’ accurately?’. This would allow students to explore the interaction of post-colonialism (by far the most important concern for the NAM), its manifestations in Korea and Vietnam (which were catastrophically misinterpreted by the USA), the Non-Aligned Movement and their chief concerns. This could lead on to addressing the ways in which the superpowers tried to force the post-colonial developments into the paradigm of the Cold War and how this frequently backfired on them. It could also lead to an investigation into the argument presented by Best et al who argue that even though the NAM attempted to pursue their own aims during this period, they were limited by Cold War politics and western resistance. Towards the middle of the Cold War, as the attention of the superpowers shifted towards South-East Asia and the Middle East, it would be necessary to teach of Nehru, Mao, Syngman Ree, Kim Il-Sung, and Nasser. Without these figures, the Non-Alignment Movement remains a faceless and homogenous group, without direction or motive. Only by comparing and contrasting the attitudes of Tito, Nasser, Nehru, Nkrumah, and Sukarno is it possible to see what made the Non-Alignment Movement work as a bloc, and see where the faultlines lay for its later fracture … most teachers would not have the time needed to cover these leaders in sufficient detail. Unfortunately, I have no silver bullet to this issue, and my only suggestion is to carefully map out which characters will be included within your narrative of the Cold War and either invest in covering some of the context earlier in your curriculum (e.g. KS3 Indian Independence, before KS4 GCSE International Relations study, could introduce Nehru) or provide ample opportunity for students to carry out further research, potentially as homework. Easier said than done! Anthony Best, Jussi Hanhimaki, Joseph Maiolo and Kirsten Schulze, International History of the Twentieth Century and Beyond (London, 1st ed. 2004, new ed. 2008), Chapter 13: Neutralism, development and the rise of the Third World, 1945-2007, 315-334. In week five of our Teacher Fellowship Programme, ‘The Cold War in the Classroom‘ in collaboration with the Historical Association, discussions moved away from standard Cold War narratives, to instead focus upon how the Cold War impacted ordinary life on both sides of the Iron Curtain. In the following article, originally published for The Historical Association, Jessica Reinisch provides insight into the weeks’ discussions. This week was all about moving away from the standard Cold War narratives of political summits and military showdowns of the superpowers. Instead, we asked our teachers to think about how the Cold War dynamics impacted upon ‘ordinary life’ on either side of the Iron Curtain. The reading focused on the Soviet National Exhibition in New York in June-July 1959, and the reciprocated American National Exhibition in Moscow a few weeks later. Susan Reid’s article on ‘Soviet popular reception of the American National Exhibition in Moscow’, and a document collection edited by Shane Hamilton and Sarah Phillips, provided context on the infamous ‘Kitchen Debate’ between Richard Nixon and Nikita Krushchev. Elena Hore’s podcast considered the impact of the Cold War on Russian families. An essay by Cristina Carbone looked at US reactions to the exhibition in New York. A list of references is included at the end of this report. Central to this ‘Soft’ Cold War were skewed portrayals of ‘ordinary life’ on the other side of the Iron Curtain as significantly worse than at home. “Both East and West were able to use propaganda to perpetuate these images of the other, images that while having some basis in reality were very convenient to those in power. As Dr Hore explained in the podcast; the Cold War was convenient for the Soviet leadership as it meant that people were willing to sacrifice in order to prevent attack. This image of the oppressed people of Eastern Europe was a convenient one for the West. It gave them justification for high defence spending, questionable foreign policy and involvement in proxy wars throughout the period. What results did this propaganda war ultimately have? Some of the teachers also thought about the role played by public opinion in this propaganda. Although most agreed that this ‘Soft’ Cold War was significant to the history of the Cold War, some of our teachers argued that it would be a mistake to forget about the military and diplomatic confrontations. Some of this weeks’ primary sources and podcasts seemed particularly useful for giving students a richer picture of the Cold War. Our teachers also saw plenty of ways in which the ideas and content of the week’s readings could be put to use in the classroom. Susan Reid, “‘Who Will Beat Whom?’ Soviet Popular Reception of the American National Exhibition in Moscow, 1959,” Kritika: Explorations in Russian and Eurasian History 9, No. 4 (2008), 855-904. Shane Hamilton and Sarah Phillips, The Kitchen Debate and Cold War Consumer Politics: a brief history with documents (Bedford/ St.Martin’s, 2014), “Introduction: The Kitchen Debate in Historical Context”, 1-31. Cristina Carbone, ‘Staging the Kitchen Debate: How Splitnik Got Normalized in the United States’, in: Ruth Oldenziel and Karin Zachmann (eds), Cold War Kitchen: Americanization, Technology and European Users (Cambridge MIT Press, 2008), 59-81. “Living in the GDR”, in Jussi M. Hanhimaki and Odd Arne Wested (eds. ), The Cold War: A History in Documents and Eyewitness Accounts (Oxford, 2003), 253-257. ‘A Letter to Prison’, Prague, 1950, and other sources on the Socialism Realised project website. This article was written by Jessica Reinisch for The Historical Association. Read the original article here. As part of the Being Human festival’s series documenting examples of best practice public engagement, we were recently asked to reflect on our experiences of organising the International London: Walking Tours that took place in November last year. For Being Human 2016, the Reluctant Internationalists led a series of walking tours around central London exploring the city as the home of international projects. We tried to present an alternative history of London, as a magnet for international ideas and collaborations. We conducted three tours on Wartime London (led by Jessica Reinisch), Epidemic London (led by Dora Vargha), and Communist London (led by Ana Antic & Johanna Conterio). 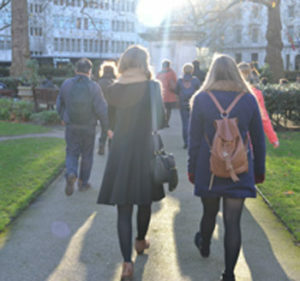 Each tour took participants through the streets of central London to illuminate the stories, lives and organisations often hidden amid the contemporary bustle of the city. 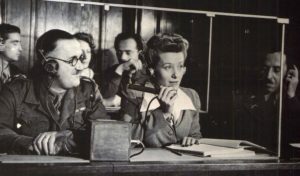 The tours aimed to bring to life the Reluctant Internationalists project’s research on the history of twentieth-century internationalism, by telling engaging stories about people, places and events. Anchoring these stories in the sites of contemporary London, allowed us to engage the public with research and demonstrate how the history of international collaboration was shaped by and in turn helped to shape the city. What worked particularly well in the planning, design and delivery of your event? Organising three tours around separate themes helped to ensure the walks had a clear focus and a consistent historical narrative. The tours’ academic leads drew on their research and specialist knowledge of the international history of London. The format of the walking tours also helped to open up the project’s research to new audiences and created an excellent opportunity for academics to conduct Public Engagement with Research in an accessible format. The academics created engaging, personalised tours –one handed out home baking made to an original wartime ration-era recipe and another evoked the spirit of the era by leading a group sing-a-long of socialist songs. Additionally, the design of the event provided an opportunity to live tweet the walks. This created a new means of visual engagement with the project’s work using social media – it greatly helped that the sun was shining for all three walks! What were the main challenges and how did you overcome these? For the event, registrations were managed via an online booking system. However, this proved challenging; attendance numbers were difficult to monitor and regulate, especially as the tours were free and open to all. Similarly, keeping the walking group together at times proved problematic due to the number of attendees. Planning is key! Walk the routes in advance and take consideration of access requirements. Utilise social media both for promotion and during the event itself. Live tweeting the tours enabled us to create a visual record of each tour as well as engaging a wider audience. Be flexible and ensure schedules can be adapted if unforeseen circumstances arise, for example blocked routes or having to change the pace of a walk. Document the event through a variety of means (for example photographs, interviews, blog posts, and guides to key stops.) We are also developing digital ‘reconstructions’ of the tours to enable links in London’s international history to be further emphasised. This article was originally published as a case study on the Being Human festival website. The original can be accessed here. Week four of our Teacher Fellowship Programme, ‘The Cold War in the Classroom‘ in collaboration with the Historical Association, focused on the Iron Curtain with the Fellows examining how permeable it was. In the following article, originally published for The Historical Association, Ben Walsh provides a summary of the discussions. Iron Curtain: how permeable was it? 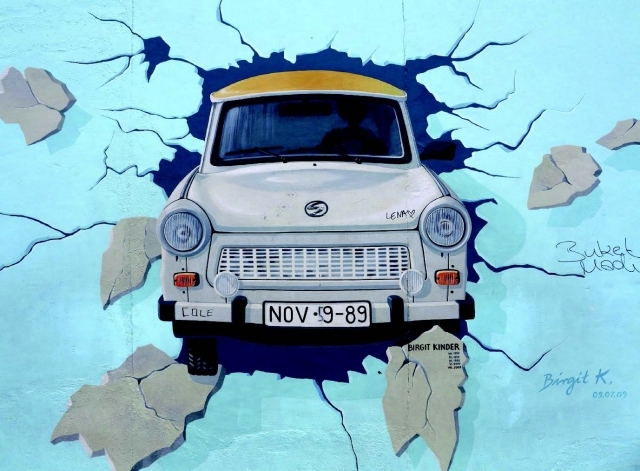 This week the focus was on the Iron Curtain, and the extent to which it was really an impenetrable barrier or whether it was possible for people, information and ideas to cross it. Our teachers were asked to read Michael David-Fox’s book chapter ‘The Iron Curtain as Semipermeable Membrane’ and Mark Smith’s article ‘Peaceful coexistence at all costs: Cold War exchanges between Britain and the Soviet Union in 1956’. They were also asked to look at the multimedia online resource Commuting between East and West. There was a lot of discussion on how these articles challenged preconceptions about the Iron Curtain, along with some thoughtful responses to the ways in which Berlin might be used as a resource for helping students to develop an understanding of the mechanisms of the Cold War which went beyond the simplistic. Whilst the reading this week alluded to the ability to gain knowledge and resources from the West despite the descent of the Iron Curtain across Europe, I feel that the Berlin Wall in particular came to represent Stalin’s portrayal of it after Churchill’s initial speech: a way of keeping the West out. Whilst a vital measure in stabilising Europe after its construction in 1961, it ultimately divided families and allowed for the creation of a semi-totalitarian state in the GDR which affected people’s lives in a variety of ways. The Berlin Wall was not permeable in the way that the Iron Curtain was. The reading this week has certainly developed my subject knowledge. I found the Michael David Fox article on the origins and demise of the Stalinist Inferiority Complex particularly interesting. The way in which the idea of superiority was protected by isolationism and threatened by Khrushchev’s thaw is intriguing. Yagoda’s arrest during the Great Terror revealed ‘that the Soviet elite were addicted to the far-from-forbidden fruits of Western material culture’, yet they continually asserted Soviet superiority. Soviet troops, as they moved into Poland in September 1939, assumed that they would be ‘raising the newly conquered territories up from backwardness’, but found that Poland was actually ‘the land of plenty’. They also continued to assert that ‘we have everything’. Tränenpalast (‘Palace of Tears’) at Friedrichstraße station is a great place to visit after seeing segments of the Berlin Wall or Checkpoint Charlie. It was at the Friedrichstraße train station where families from the east and west were allowed to meet and eventually say their tearful farewells (hence the nickname). The museum is small, but fairly new, and contains some great resources which you can use to explain the ‘permeable divide’. Rudi Dutschke Strasse could be used to illustrate the possibility of political and ideological interchange. This would be an opportunity to explore how the two sides were not completely ideologically isolated by looking at the story of Rudi Dutschke, a memorial plaque to whom is found here (he was shot in the head here by a anti-communist during a protest in 1968). Dutschke was educated in the GDR, but fled to the West just before the building of the wall. Here he was involved in the 1968 student protests against the oppressive nature of the West German regime and the Vietnam War. He was then expelled from the UK whilst attending Cambridge University by Ted Heath for being an ‘undesirable’. We could therefore assume that he was almost a communist agent, however in the 1970s he began to plot against the communist governments in Eastern Europe. His story therefore might illustrate the non-binary nature of Cold War politics (as stressed in the Mikkonen and Koivunen article). At the end of the week, it was clear that the reading and discussion had really got our teachers thinking and several of them were getting quite excited as they had visits to Berlin coming up! Several of the teachers are also beginning to clarify their thinking about the resources they are going to create, which will of course be shared via the HA website. I enjoyed the first focus this week, as I have always found Berlin a fascinating example of where a geographic location can be imbued with symbolic significance beyond its strategic value, similar to Jerusalem during the Crusades or Stalingrad during the Second World War. Within my teaching I have returned to Berlin as a ‘touchstone’ at key points and used it as a way of identifying changes as well as continuities within the conflict. This will now be supplemented with further examples drawn the HA podcast this week by Holger Nehring, which I found very useful. For example, while I do use the Kennedy speech in my teaching, I have not considered using the Reagan speech in the same way even though I knew it existed. As a result, I feel once again that my subject knowledge has been deepened by this course in a way that will make a direct impact in my classroom teaching. Khrushchev’s continuation of the superiority complex, in terms of culture and lifestyle also really interests me. The way in which the idea that consumer goods could be used in a ‘collectivist, socialist lifestyle’ was pushed – collectivist carpools for example – is fascinating. The ‘insuperable’ challenge that the superiority complex faced when the SU opened to the outside world is something that I would certainly explore with A Level students, and possibly GCSE. In terms of the resource, I am definitely drawn to the idea of creating something which focuses on everyday life in the SU and Eastern Europe. I’m intrigued by why an ‘Ostaligia’ – yearning to return to the communist past – emerged in Post Communist Europe and I think this could be a good enquiry question as part of the Year 9 topic on ‘Living under Communist rule’ I am hoping to plan. Michael David-Fox, “The Iron Curtain as Semipermeable Membrane”, in: Patrick Babiracki and Kenyon Zimmer (eds), Cold War Crossings: International Travel and Exchange across the Soviet Bloc, 1940s – 1960s (Arlington, 2014), 14-39. The workshop will bring together children’s authors, illustrators, publishers, museum professionals and academics to consider the ways in which different disciplines depict the stories of refugees for children. Throughout the workshop we will think about how refugee narratives are written, exhibited and delivered to children. Three sessions will engage with particular media (chiefly, books and museum exhibits). The final part of the workshop will give children’s authors and illustrators the opportunity to present current projects and receive ideas and feedback from the range of professionals participating in the workshop. The event is free and open to all but spaces are limited and booking is essential. To reserve a place, please email reluctant.internationalists@gmail.com. In week three of our Teacher Fellowship Programme, ‘The Cold War in the Classroom‘ in collaboration with the Historical Association, the Fellows examined the flash points and near misses of the conflict, with particular focus on the ‘Able Archer 83’ incident. In the following article, originally published on The Historical Association, The Reluctant Internationalists’ Jessica Reinisch provides an overview of the discussions. Flash points and near misses: why didn’t the Cold War ever turn into a ‘hot’ one? This week our teachers read up on a still relatively little-known Cold War incident, a routine NATO military exercise named ‘Able Archer 83’ that took place in Western Europe in November 1983. The simulation was so realistic that it convinced some Soviet officials that the West was preparing for a nuclear strike. We asked our group to read excerpts from the recently declassified Able Archer report, along with a Guardian article about the declassification and a chapter by Paul Level on Cold War arms control. If they wanted to read more, there was also an article by Arnav Manchanda and the HA podcasts on other Cold War crises. The group discussed the significance of ‘near-misses’ such as Able Archer 83 in the history of the Cold War, and wrote some very thoughtful and imaginative pieces on how they could be taught in the classroom. Thinking about the role of Able Archer in histories of the Cold War got many of our teachers fired up. Was Operation Able Archer responsible for bringing the world closer to nuclear war than the Cuban Missile Crisis? New information has given us greater understanding of a crisis which started as a game but nearly ended in disaster; Operation Able Archer. Not only did this crisis nearly cause a nuclear war, but it also contributed to the end of the Cold War. It demonstrated how superficial the so-called achievements of détente had been. Able Archer shows the non- proliferation treaties and agreements during the Cold War actually, in practice, held little real underlying meaning. The episode struck me as a way into studying the uniqueness of the Cold War in a global setting. The non-event… seems to set a pattern for other events in the Cold War. Throughout the reading I was thinking about a criteria for ‘danger’ and how within such a long war could students ascertain which events were more dangerous than others. This could be linked to the personalities of those who had their finger on the button – e.g. Reagan’s aggressive stance against the Soviet Union compared to Nixon’s perhaps. The issues highlighted by Able Archer, although its detail was unknown at the time, are reflected in the contemporary popular culture. In that year ‘The Hunt for Red October’, by Tom Clancy, was being written to be published in 1984; War Games 1983, a popular film, reflecting the dangers of having inflexible systems for defence which isolate human intervention was being shown. Interestingly it was actually the human element that eventually led to the Able Archer situation being defused. Finally, ‘The Day After’ an American television film first aired on November 20, 1983 and had an impact on Reagan. The role of the media in the Cold War could be an area launched from a study of the incident. …the best reason for looking at Able Archer is as a means to draw meaningful comparisons between different Cold War crises and thereby deepen students’ understanding of the importance of context in who was willing to confront, compromise and co-operate at different moments during the Cold War, giving depth to their explanations. …for me it was mainly interesting as a route into thinking about significance. The idea that confrontation in the Cold War had shifted from being very public in the 1950s and 60s (Berlin, Korea, Cuba etc. ), to being so secret in the 1980s that one side weren’t even aware that there was a potential conflict, must tell us something. Equally, that this crisis has gone largely unnoticed in many histories of the Cold War also made me think about the public nature of diplomacy in the Cold War, and how this interacts with the writing of history. The Able Archer 83 incident could be used as a vehicle to explore a variety of aspects of the Cold War and wider historical concepts. Firstly, it could be used to teach students content, developing knowledge and understanding on the relative failure and impotence of Détente and the various arms limitation talks as suggested by the Lever article, the impact Reagan’s early aggressive stance on Soviet security concerns, the role of intelligence and espionage, Soviet weaknesses and technological backwardness at the time, and the role of NATO in terms of Western defences and Soviet concerns. Secondly, using Able Archer to further develop students’ understanding of second order concepts would be an interesting idea. Causation – Why did the Soviet Union feel an increased threat in 1983? Why did the Cold War come to an end? How far were misunderstandings the reasons behind Cold War tensions? Significance – Comparison of the threat posed by various Cold War crises including Able Archer, Cuba, Berlin Airlift, Berlin in 1959-61. Interpretations – Using extracts of the ‘The Soviet War Scare’ source, Deutschland ’83, the Guardian and the Lever article to compare views on the severity of the incident and reasons behind it. Reliability of sources – how reliable is Deutschland ’83 as representation of Cold War tension in 1983? Finally, and this may be personal to my own teaching experiences, this period of Cold War history has always been one of the more challenging periods of the conflict to teach/ for my students to remember. Able Archer provides a brilliant reminder to students as to the severity, importance and complexity of Cold War relations and could be an event/ lesson that inspires the intrigue, enthusiasm and reminds of the relevance of studying the Cold War, hopefully keeping motivation high in the final weeks of the course. Why is it important to teach students about a non-event? … Because Able Archer is itself an outcome of the Cold War. It stands out as a reminder of the role ideology played throughout the conflict. After the Cuban Missile Crisis of 1962, you’d be forgiven for thinking the danger of all out nuclear war had passed – yet Able Archer is a demonstration of the danger of ideologically driven decisions, and how important ideology was in bringing the Soviets to the brink of launching a pre-emptive nuclear strike against the United States in 1983. Why should you teach ‘Able Archer’? To help students to understand the impact of Reagan’s leadership upon Cold War relations and evaluate the Soviet perception of the ‘Evil Empire’ speech; To allow students to explore the relationship between Thatcher and Reagan; To assess its importance to the end of the Cold War; To evaluate the role of intelligence in Cold War relations; To compare its significance to the Cuban Missile Crisis; To explore the role that political suspicion and misunderstanding played throughout the Cold War crises. A study into the Cold War is extremely difficult due to the unique structural factors at play within it, particularly the presence and impact of nuclear weapons. One inherent danger surrounding its study is that students too often can’t appreciate these factors and thus make anachronistic assumptions about the real risk of nuclear war. This lesson would ensure no student could doubt the reality of fear surrounding the use of nuclear weapons in the Cold War, and would be immeasurably enriched from its knowledge. Why students should learn about Able Archer: Never, perhaps, in the postwar decades was the situation in the world as explosive and hence, more difficult and unfavorable, as in the first half of the 1980s…. Was 1983 the year when the world should have ‘held its breath’? I would strongly recommend a comparison of the Cuban Missile Crisis and Able Archer. In 1983, the Russians didn’t feel in control. They felt out manoeuvred by the US and under incredible pressure from Reagan and the West. This led them to make the ‘irrational, rational’ which could have resulted in them launching a pre-emptive strike against the US. What is quite scary about 1983 is the fact that the general populations were in the dark: unlike during the Cuban Missile Crisis. Was Margaret Thatcher the ‘Iron Lady’ or ‘US poodle’? Why did Operation RYAN lead the Soviets close to nuclear action? Students will find Operation RYAN fascinating. Who would have known that the Soviets would be monitoring the amount of blood donations and the price paid for them as evidence of an imminent nuclear attack. Such was the belief in the ‘fiction’ that intelligence agents in western nations were ordered to find proof. Operation RYAN and how it distorted the Soviet’s view of Able Archer is a great way to being students into the world of Cold War spies. Able Archer lends itself perfectly to a one off lesson which would engage students whilst allowing them to understand the very real tensions that existed even in the years approaching the end of the Cold War. Personally, I would struggle to devote a whole lesson to Able Archer as studied in isolation I don’t think it is as powerful as taught in combination. … As a lesson resource I would combine it with the Doomsday clock charting events during the Cold War and asking students using contemporary sources to place events of the Cold War onto the clock. It would be interesting to ask students to compare Able Archer to events such as the Korean War, Cuban Missile Crisis and ask how close the world did come to a nuclear war, particularly as the clock was 2 minutes to midnight in 1953 (Korean War). At the end of the week, it was clear that the teachers saw plenty of ways of putting their new knowledge of the Able Archer incident to use in their classroom teaching. Personally I very much enjoyed the chapter on ‘Secret Nuclear Weapons Accidents’ in the Hanhimaki & Westad collection, as it was all new to me. I’d probably use it at the stage where I challenge students disbelief that such a thing could happen, or even drop it into the conclusion as a sort of ‘does the fact it’s not an isolated incident change your inferences or reinforce them in any way’ activity. We always focus on the idea of misunderstandings in the origins of the Cold War; it might be interesting to follow this theme through to the final stages of the CW. I am keen to continue exploring more about the effects of Able Archer – as I would like to know the validity of my assertion that this event was a cause of the end of the Cold War. This event will certainly feature in my teaching of the ‘End of the Cold War’ – probably as a linking lesson between Reagan and Gorbachev. I’ve really enjoyed looking into Able Archer this week, and have been dropping Operation RYAN into all Cold War conversations I have (surprisingly a lot!). I think it is something I am certainly going to introduce into my A-Level teaching: … the exam textbook we use for the Cold War in Europe course mentions the shooting down of the Korean Airliner and briefly mentions a NATO exercise that heightened tensions, but I really don’t think it does the matter justice. Whilst no major incidents occur, understanding the ideological drive between the two sides at this time, and how it adds to increasing tension at the end of detente are crucial in understanding the path to the end of the Cold War. If nothing else, it continues to assert just how different Gorbachev was compared to his predecessors. I intend to use the new subject knowledge that I have gained this week to enhance my teaching of the political context of the early 1980s. I knew very little about Able Archer or Operation Ryan and I have really enjoyed this week’s task. What a fascinating set of events. I teach about Thatcher’s role in ending the Cold War and I have, in the past, taught the Gorbachev era and the end of the Cold War, but I have never considered this event as influential. Most interesting was the heightening of paranoia amongst the Soviet leadership at this time and Operation RYAN. So interesting. I will definitely use what I have learned this week to add context to the Thatcher period and her relationship with Reagan. I think there is also scope for looking at Able Archer as part of the new GCSE (which covers the end of the Cold War). Stories such as these can only enhance understanding and increase engagement in the content. I am keen to build in the doomsday clock into our teaching and think [Able Archer] could form an interesting part of the discussion as we fill in the students in what happened next before finishing the Cold War. Reading the executive summary alongside the contemporary sources of other nuclear accidents has provided me with even more examples I can use when teaching the Cold War within my classroom. I also appreciated the challenge of planning a lesson that would not normally fit within an ‘exam orientated’ scheme of work and would have to be justified to SLT or a HoD; I feel it fits in well to my thoughts on the last week’s task about teaching beyond the essentials of the specification in order to broaden and deepen students understanding of the period. The German-US TV series Deutschland ’83 (2015) is available on Channel 4 on Demand. Episode 7 dramatised the Able Archer incident. In week two of our Teacher Fellowship Programme, ‘The Cold War in the Classroom‘ in collaboration with the Historical Association, discussions centred upon the nuclear age. In the following article, originally published on The Historical Association, Ben Walsh provides an overview of the week. This week in the programme the focus was on nuclear politics and the experience of living under the constant threat of nuclear war. We asked the Teacher Fellows to study another HA podcast, Matthew Grant’s Living in the Atomic Age. We also asked them to read a couple of articles by David Holloway and David Seed and a book chapter by Jussi M. Hanhimaki and Odd Arne Westad. The references are at the foot of the report. As a task, we then asked them to look at three different examples of film sources relating to the Cold War and we put them in a hypothetical position where they could only choose one film to use in teaching and to justify their choices. Since we do that kind of thing to our students all the time the aim was to give the teachers a taste of how it felt! Once again this group rose to the challenge, combining scholarship, incredibly imaginative and thoughtful pedagogical thinking and impressive advocacy. Having focussed upon the clear limitations of ‘Duck and Cover’ this is still the film that I would choose to use in a lesson. We will soon be studying McCarthyism and the Red Scare at GCSE and I could see that this would be a useful resource in trying to help students understand the culture of fear that must have pervaded the US in the late 40’s and early 50’s. ‘Bert the Turtle’ is certainly useful for demonstrating to students how America perceived the threat of nuclear war in the 1950s. The US Federal Civil Defense Administration (in consultation with the National Education Association) appeared to give a sense of inevitability about “when the bomb goes off” (rather than ‘if…’) – which suggests that the USA was not only preparing itself physically for a nuclear war, but also preparing the mentality and psyche of the population. I would be interested in getting my class to think about the different ways that the topic of nuclear warfare has been presented to school children. I think students sometimes get caught up in the high politics of the Cold War, so to bring it back to the average person, and in this instance, students like themselves would offer an interesting topic for discussion … There is also very much a sense of constant threat and an emphasis that the pupils in the video should always be alert. The youth of the intended audience is reiterated by the use of Bert the Turtle – if they wanted to protect the innocence of students was there another way to deliver this message? Listening to the Matthew Grant podcast it got me thinking further about motivation (something I seemed to be drawn back to) and how the US government used the concept of the ‘American family’ to get public support behind US foreign policy and in particular nuclear spending. My students are always shocked when I use the figure $5.5 trillion to describe US spend on nuclear weapons from 1940 – 1996 and will often have interesting questions about why it was such a priority for the USA, alongside the spend, as Steven pointed out on Marshal Aid and Point 4. The podcast also highlighted themes that came out of the podcast last week on the ideological differences of the superpowers and the fear that each side felt for the other. I thought Grant’s focus on the belief that ‘anti-communism would save the American family’ really interesting. After watching ‘Protect and Survive’, I then watched a Panorama episode from March 1980 (2 months before the release of ‘Protect and Survive’) which criticised the British government’s civil defence theory and the lack of information being disseminated to the general public. The programme revealed that the government only intended to release the film if war was imminent (3 days before) … They interview a specialist, who had worked in the civil defence department, who says that ‘Protect and Survive’ should actually be known as ‘Neglect and Die’. I therefore think there is great scope in getting students to investigate why the British government took this approach. Political expedience is a reason put forward in an article entitled The strange death of UK civil defence education in the 1980s, which states that ‘Protect and Survive’ was only ever meant to be ‘politically defensible’ and that the reiterated instruction to ‘stay at home’, echoed in an earlier 1960s civil defence pamphlet the ‘Householders Handbook’, was merely aimed at prevented social panic and rioting. I would imagine that the different generations of children would react differently – those of the 1950s I feel may not have had that much knowledge about the atom bomb, and so it had to be raised in a carefully considered way. Those in the 1980s however may have been much more aware of the dangers of nuclear attack – it was so much more prominent in daily media and in political events across the globe by that point. It was becoming much more prominent in popular culture by that point – pop music was referencing the dropping of the bomb and artists had been reflecting on its horrors too, and literature such as ‘On the Beach’ by Nevil Shute (which I found incredibly moving) would have been widely read. I remember ‘Two Tribes’ very well and hadn’t realised that they had used soundbites ‘Protect and Survive’ in it. Another really interesting article entitled ‘Britannia Rules the Atom: The James Bond Phenomenon and Postwar British Nuclear Culture’ shed an interesting light on the context of the James Bond films of the Cold War. The article notes that James Bond films consistently overvalued Britain’s nuclear capabilities and that the ‘James Bond Phenomenon often paralleled British government policy and propaganda’. A specific example is given from the 1980s ‘Never say Never Again stood in sharp contrast to cultural manifestations of the fear of the global thermonuclear war that surfaced during President Ronald Reagan’s first term in office….And, what is more, Never Say Never Again seemed to mirror official British government propaganda, most notably Whitehall’s official civil defense booklet ‘Protect and Survive’. So what about the impact back in the classroom? I teach British Society 1979-1989 at A Level and I am now very aware that there is little reference made to nuclear paranoia and the way that popular culture responded to the international context at this time. I will certainly spend a bit of time looking at this this year. I might also think about planning a unit of work for year 9 entitled ‘Living through the Cold War’ which looks at the British experience along with the US, Soviet, Japanese and Eastern European experiences. Alternatively, I might narrow it down and get Year 9 to look at British government public information films (There are dozens of these on the National Archives website) and their value to the historian researching British society/culture at that time. I found this week’s focus on the popular culture and media portrayal of the Cold War a fascinating one, and it has definitely provided me with some more high quality clips to use in my own teaching as well as distributing amongst colleagues. I find that a good video source can often provide students with a much needed opportunity to connect knowledge to a wider contextual framework, and to build that valuable sense of period which is often skipped past in order to get to the ‘exam focus’. In this I was reminded of Michael Fordham’s blog post about the value in teaching a knowledge rich curriculum that goes beyond the essentials (found here: https://clioetcetera.com/2016/11/19/what-makes-a-curriculum-knowledge-rich/), as while none of these video clips could be considered ‘essential’ to teaching the Cold War, they are crucial in helping students build connections and gaining confidence. I found the focus this week of the cultural narrative of the Cold War a really interesting one. Seed’s article really stressed the unique quality of the Cold War in comparison to previous conflicts. I hadn’t really considered before, who was the ‘enemy’ in the Cold War – an ideology rather than a figurehead. I really like the idea of comparing the narratives of the Americans and Soviet Union, the Americans willing to depict the horrors of nuclear war in comparison to the topic being banned in communist countries. I would be interested to research further into what narrative was being told in the Soviet countries and how much they understood of the nuclear race against America. I would also be curious to find out the impact of the narrative on American society, the fact it was such a feature of science fiction almost allows it to take on a mythical stance so quickly after the dropping of the bomb on Hiroshima. Last week we were delighted to welcome our new Children’s Author/Illustrator Visiting Fellow, Francesca Sanna. During her time as Visiting Fellow, Francesca will be working on a range of projects. 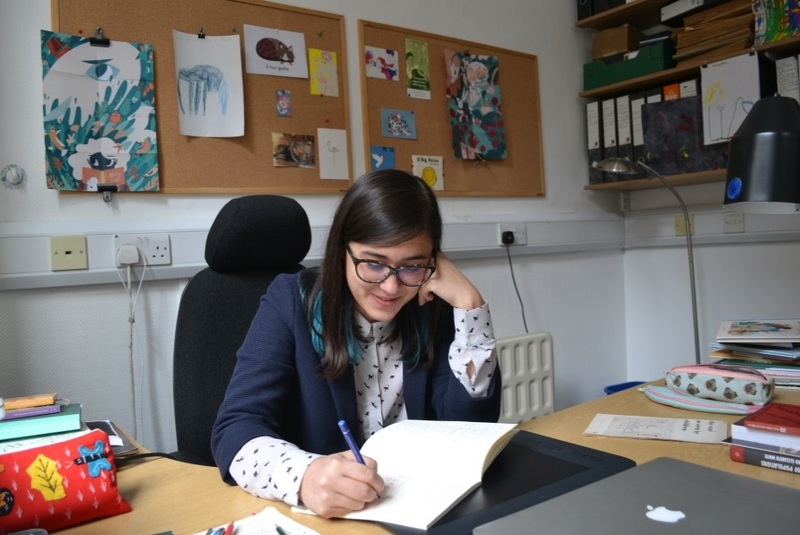 These will include conducting research for her next book, giving a talk on depicting refugees in children’s literature at a workshop to be held at Birkbeck and undertaking a series of visits to local primary schools. Over the coming weeks, Francesca will also be taking part in a Q&A session providing insight into the research and interviews she conducted while creating The Journey. Further details and information on all these activities will be posted on the project blog. Welcome to the project team Francesca! Together with the Historical Association, we recently launched a Teacher Fellowship Programme on “The Cold War in the Classroom”. Ten secondary school teachers attended a two-day residential held at Birkbeck College on the history and historiography of the Cold War, covering both academic and teaching practices. Following this, the fellows are currently undertaking a ten week online course exploring a range of historical sources and developing ways to use them in the classroom. In the following article, originally published on The Historical Association, Ben Walsh provides an overview of discussions from week one. Well, the HA Teacher Fellowship Programme on the Cold War is now well and truly underway. After an intensive opening weekend residential at Birkbeck University the fellows have been working away most diligently and impressively on the online course. What is really striking is the level of engagement and enthusiasm which these full time working teachers are able to bring to the project. 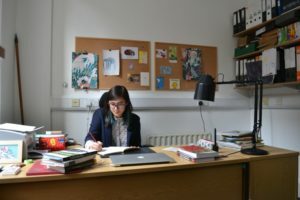 In the first week we asked to them to listen to some of the podcasts on the HA website, particularly Dr Elena Hore’s piece on Ideology and the Cold War. However, as our teachers will confirm, you should approach these podcasts with care. There is so much good material in the HA’s podcast offering that they can become addictive! In addition to the podcasts the teachers have also been reading articles by leading academics in the field. The wonderfully titled ‘How (Not) to Study the Origins of the Cold War’ by Geir Lundestad generated a lot of interest and discussion about the Origins of the Cold War but also about current school curricula. Key points emerging about the history were …. The origins of the Cold War has long been dominated by a bipolar approach and the aim to apportion blame. There are different waves of interpretation that blame one side or the other, or both, as historians writing about the Cold War reassess the world they live in. But in school curricula this blame discourse is often studied as a static, fixed phenomenon that ended with 1989/1991. As our teachers are realising, the debate between different schools of interpretation by academic historians is very much ongoing. If you like the look of what is going on in the Fellowship, we hope to run more programmes of a similar nature on a range of different periods of history. Keep visiting the HA web site for more details. Geir Lundestad, ‘How (Not) to Study the Origins of the Cold War’, Odd Arne Westad (ed. ), Reviewing the Cold War: Approaches, Interpretations, Theory (2013, 1st 2000]), pp. 64-87. This article was written by Ben Walsh for The Historical Association. Read the original article. Research on the global history of socialism has been growing, but the majority of narratives and frameworks for approaching the history of the so-called ‘socialist world’ are still focused on the relationship of the United States and the Soviet Union. In a one-day workshop, to be held on Friday 3rd February at Birkbeck College, discussion will take stock of recent historical contributions that shift focus away from the superpowers and from Washington and Moscow, and instead consider the circulation of ideas, goods, people, and practices within and beyond the socialist and communist worlds on their own terms. Which conventional Cold War concepts does taking a global approach to the history of socialism and communist reinforce, and which does it contest? What are the conceptual and methodological challenges of constructing an alternative history of internationalism from a global socialist perspective? Was there such a phenomenon as ‘socialist globalisation’ and what did it entail in the context of the Cold War and decolonisation? How do we understand the global boundaries and exchanges between the communist world in the East and the institutions of (non-communist) socialist internationalism in the West? 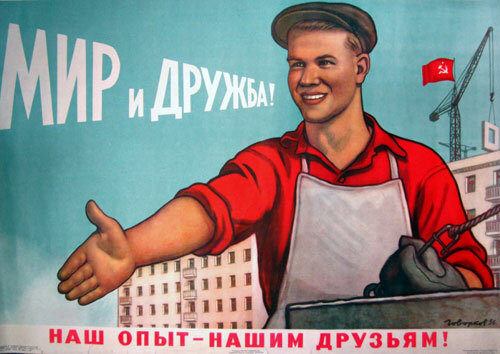 How does shifting perspectives away from the US-Soviet binary change our understanding of socialist networks? To what extent can we leave the view from the West behind? The Socialist Internationalism workshop aims to foster discussion around these central questions through short presentations in a roundtable format. Presenters shall each discuss a primary source and explain the approach they take to transnational, global, and international history. Topics that will be addressed in the workshop will encompass: trade and exchange in the socialist world, the role and definition of development and humanitarianism in the socialist world, the roles of experts in socialism across the globe, and exchanges in culture and knowledge production among socialist countries and beyond. The workshop is free and open to all, however spaces are limited and booking is required. To reserve a place, please email reluctant.internationalists@gmail.com. For a month last summer (mid-May to mid-June, 2016), I had the privilege of joining the Reluctant Internationalists project group for research and interaction on themes of common interest. Among the project leader (Jessica Reinisch) and other members and guests (among them Heidi Tworek and Elidor Mehilli), the intellectual energy was remarkable. At several conferences, talks and workshops organised over the course of the short time I was there (on the Armenian genocide, the history of medicine, expertise, etc.) a broad range of interests was paired with impressive regional and temporal depth of knowledge. It is not surprising to me that so many of the project members have found jobs and received honours in the meantime. Beyond the scholarly merit of the project, I was above all taken with the comradery within the group. The tenor of discussions was always productive and the atmosphere intense intellectually, but relaxed socially. It was truly a joy to think and work among such young scholars and enhances my faith in the future of historical inquiry that they are the faces of the next generation. As for my own research, Britain was just where I needed to be this summer. Much of my time outside of Birkbeck was spent between the National Archives in Kew and the British Library. In both places I found a wealth of documents and pamphlets relating to the book project I am currently completing on “The Age of Questions,” tentatively subtitled “First Attempt at a History (in Aggregate) of the Eastern, Social, American, Jewish, Polish, Bullion, Tuberculosis, and Many Other Questions from Roughly 1800 to 1945, and Beyond.” The Reluctant Internationalists did me the honour of asking me to deliver the opening address for their new Centre for the Study of Internationalism, for which I spoke on my book project. What was “The Age of Questions”? From a spattering of references to the American and Catholic questions in the mid-to-late eighteenth century, there followed an interrogative deluge in the nineteenth. Before long, publicists, scholars, statesmen, novelists, religious authorities, millers, doctors, and others competed to derive the best solutions to the Eastern, Belgian, woman, labour [worker], agrarian, and Jewish questions. These were folded into larger ones, like the European, nationality, and social questions, even as they competed for attention with countless smaller ones, like the Kansas, Macedonian, Schleswig-Holstein, and cotton questions. The most prominent figures put their pens to them: Alexis de Tocqueville, Victor Hugo, Karl Marx, Frederick Douglass, Fyodor Dostoevsky, Rosa Luxemburg, and Adolf Hitler, to name just a few. That questions were construed as problems is evident from another familiar formulation: the “definitive” or “final solution.” My book wonders: Was there a family resemblance between questions, or certain patterns that recurred or migrated across them? Have they disappeared, or are they still with us? Being among the Reluctant Internationalists at Birkbeck helped me bring this project to completion. My archival and other findings at Kew and the BL filled the last of the holes in the analysis relating to the origin of the age, in which British politicians and publicists played the leading role. I left London just days before the Brexit vote. As such, I will always remember that month as an especially wonderful time before the general unravelling that has since ensued, and that shows all the more the unquestionable relevance of the Reluctant Internationalists project.